Heat oven to 400°F. Brush 1 1/2 teaspoons of the oil on large cookie sheet. Unroll dough on cookie sheet; press into 14x12-inch rectangle. Brush remaining 1 tablespoon oil over dough. Bake 8 minutes. Meanwhile, heat 10-inch nonstick skillet over medium-high heat. Add chorizo; cook 4 to 5 minutes, stirring occasionally, until meat starts to brown. Drain on paper towels. Reduce heat to medium. Add onion; cook 5 minutes, stirring occasionally. Stir in vinegar; cook 5 minutes longer or until onion is soft and caramelized. Remove from heat. 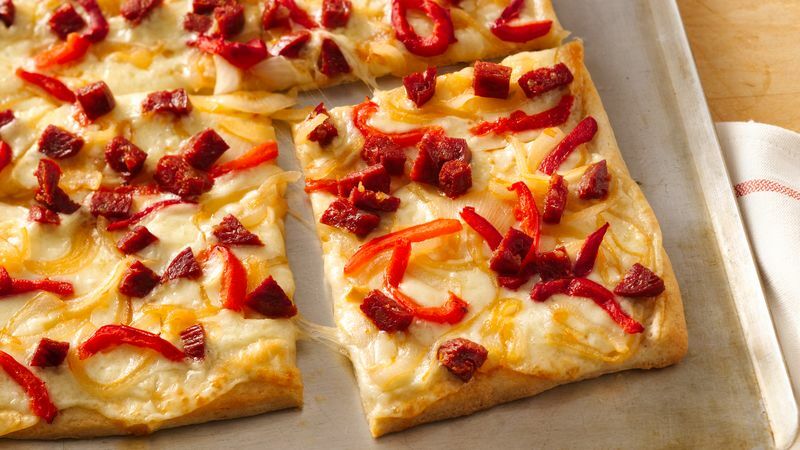 Top partially baked crust with cheese, onion, bell pepper and chorizo. Bake 8 to 10 minutes longer or until crust is golden brown and cheese is bubbly.